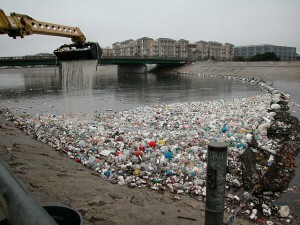 By now most people are aware of that a lot of plastic is floating in our waterways. One study estimated that 8 million tons of plastics are swept into waterways annually — equivalent to a garbage truckload every minute. In the marine environment, plastics break down into indigestible particles that marine life mistake for food. If no actions are taken, oceans are expected to contain more plastic than fish by 2050. In an effort to reduce waste, many companies are reviewing their packaging plans, reports IndustryWeek (Oct.11, 2018). And they have been pushed to do this over the past several years by an activist group called As You Sow.This month, food and beverage giant Mondelez International committed to making all of its packaging recyclable by 2025. Mondelez packaging was the fifth most frequently found brand waste collected as part of more than 200 audits done in 42 countries by environmental groups working on plastic pollution. In 2014, P&G agreed to make 90% of its packaging recyclable, and Colgate-Palmolive pledged to make packaging recyclable in 3 of 4 operating divisions, both by 2020. In 2017, Unilever agreed to a similar commitment by 2025, Target agreed to engage with its suppliers to phase out the use of harmful polystyrene foam for e-commerce packaging, and Unilever agreed to make 100% of its packaging recyclable, reusable, or compostable by 2025. This year, McDonald’s agreed to stop using polystyrene foam cups globally by year end, and made a bold, unprecedented commitment to recycle all packaging in its restaurants worldwide by 2025. At the same time, Dunkin’ Brands publicly committed to a schedule for phasing out foam coffee cups. And KraftHeinz agreed to make all packaging recyclable, compostable, or reusable by 2025. Why is sustainable packaging an important OM issue? What more can be done to eliminate plastic garbage?